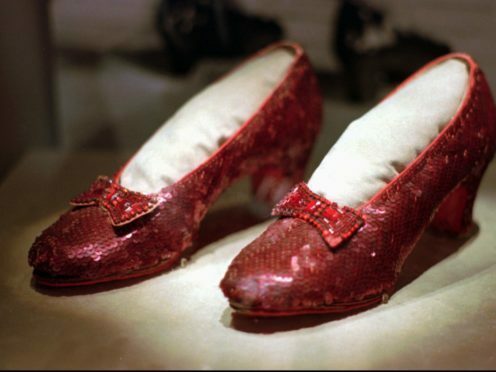 A pair of sequined ruby slippers worn by Judy Garland in The Wizard Of Oz, which were stolen from a museum in her home town 13 years ago, have been recovered, officials said. The slippers were taken from the Judy Garland Museum in Grand Rapids, Minnesota, in August 2005 by someone who climbed through a window and broke into the small display case. The shoes were insured for a million dollars. Law enforcement offered an initial 250,000 dollars reward, and a fan in Arizona offered another million in 2015. The FBI is expected to announce details of how the shoes were found at a news conference. North Dakota prosecutor Christopher Myers and Grand Rapids Police Chief Scott Johnson are due to attend. It's true! The RUBY SLIPPERS have been found! There will be a live press conference on Channel Eleven – a station from outside Minneapolis and likely other stations today at 1:00 pm. Central Time. We can barely believe this news!!!! Stay tuned. Three other pairs that Garland wore in the movie are held by the Academy of Motion Picture Arts & Sciences, the Smithsonian and a private collector. The ruby slippers are key in the 1939 movie. After mysteriously landing in the colourful Land of Oz after a tornado hit her farm in Kansas, Garland’s character Dorothy has to click the heels of her slippers three times and repeat “there’s no place like home” to return. The genre-busting Wizard Of Oz — presented in black and white and colour — was a box office smash and won multiple Academy Awards, including Oscars for best picture and best cinematography. The Judy Garland Museum, which opened in 1975 in the house where she lived, says it has the world’s largest collection of Garland and Wizard Of Oz memorabilia.